It’s almost like Christmas and your birthday happening all at once, as two of the most historically significant Corvettes come up for auction, together. As part of the 2019 Mecum Kissimmee Auction in January, a 1963 C2 Corvette convertible given to legendary GM design boss Harley J. Earl, and a 1964 C2 Corvette coupe given to his protege and successor Bill Mitchell, will be bundled together making for what’s sure to be one of the most expensive Corvette sales. Produced under Shop Order 10323, the Harley Earl Corvette, a 1963 convertible, was given to Earl by his former colleagues at GM Design. The car was actually dropped off in the driveway of his home in Palm Beach, Florida before Earl proceeded to use the car as his daily driver for two years, even using it as a parade car during the 1965 Daytona 500. It was finished in Blue Metallic and with a white stripe overlaid that was a forerunner to the 1967 big-block Stingray stripe treatment. Inside, there are special metal foot-well plates, custom leather seats with white accent stripes, and the door panels feature brushed-metal accent panels with Corvette emblems set into white inserts. The car has a 327 CI small-block and a four-speed manual transmission. Interestingly, while the Earl Corvette bears a 1963 serial number, it incorporates numerous 1965 production components, including the hood and exterior emblems, interior control knobs, and 4-wheel disc brakes. It also sports a few items that never made production, like the side-exit exhaust pipes which exit through an opening behind the front wheel wells, one of only four Corvettes ever built with this system. The 1964 Bill Mitchell C2 Corvette coupe was also painted in the distinctive Blue Metallic paint, with a special die-cast front grille and matching dual front fender vents. Other notable differences from contemporary production coupes include the absence of side vent windows, a nod to the Astro Ventilation system that would eventually arrive in 1968, and a third brake light added to the Corvette’s conventional dual light arrays. 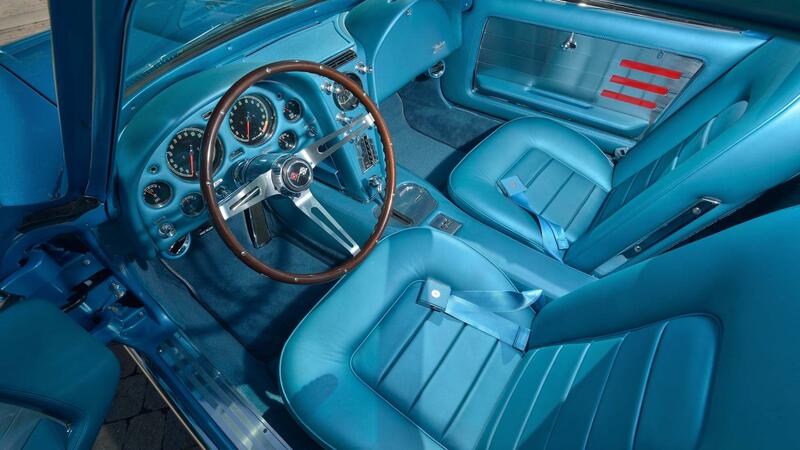 GM stylists used padded leather upholstery dyed to match the body color, also covering the center console, the instrument cluster, and the glovebox panel. There’s also the unique “chaser” lights set into the brushed-metal panels on the door panels. GM stylists made extensive use of padded leather upholstery dyed to match the body color, even using it to cover the console and the instrument and glovebox panels. Other notable custom touches include the color-matched seat belts, and a unique automatic shifter, similar to the unit used on the 1964 Buick Riviera. Mitchell’s car features a high-performance small-block V8 coupled to a 3-speed Turbo Hydra-Matic, a combination which wasn’t available until 1968. Known to Al Oppenheiser as "that long-haired Canadian". The Harley Earl car has been sold a few times in the last 10 years. It was owned by Chevrolet dealer/collector Bob McDorman at one time. It sold for $925K in 2010, then $1.5 million in 2013.